IBPS RRB CWE V Officers Scale Mains Result 2016 ibps.in: Check out CWE RRB V Officers IBPS results Online: IBPS, the apex committee for selection of Banking Personnel is finally here with the results of recently conducted examination in the country. 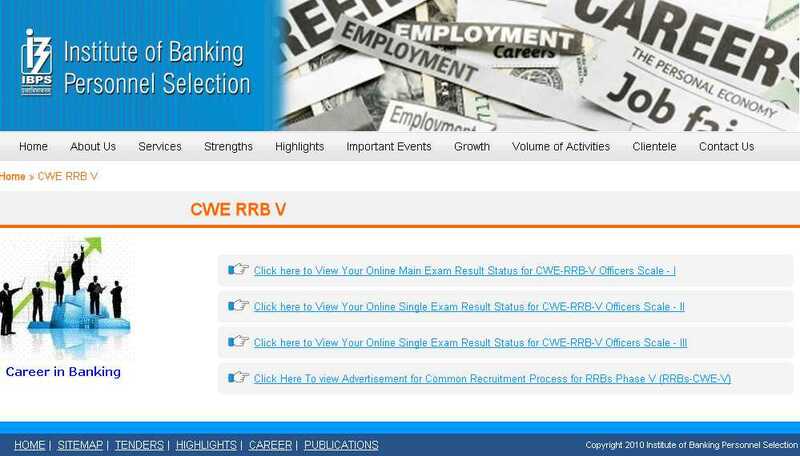 Institute of Banking Personnel Selection (IBPS) finally declared the results of much waited online primary exam for recruitment of CWE RRB Scale I, II and III officers on Tuesday. The declaration of results has been made by the Institute, and same will be available on the website for seven days from today. IBPS CWE RRB Examination was conducted on 11th of December this year. Insitute had made the online viewing of examination results available on the official website. One can follow the steps mentioned below to check IBPS results online. To Check IBPS results, Online First go to the official website and head towards the relevant page. Go to the official website. Don’t confuse with the fake links as they are not going to give you the result. Clink on the appropriate link as per your examination. Take out a print out of the result by pressing Ctrl+P or take a screenshot for future use. Selected candidates for IBPS CWE RRB V Officers will be called for an interview by the committee.